Mega-City One 2111AD, and the streets are awash with crime perpetrated by all manner of rogue citizens, whether it be a murderous child genius or a super-intelligent rottweiler called Rex. There is a solution to this problem and his name is Judge Dredd. 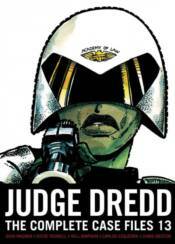 Judge, jury and executioner, Dredd is the ultimate future cop!